The 2015 Rugby World Cup which is currently in progress has embraced technology with the use of the Hawk-Eye system to help the referee adjudicate decisions, as well as assist with player safety by identifying possible concussion instances and behind play incidents (see more about technology in sports). Is this a step towards the possible futuristic rugby player imagined by the team at bwin in their Alternative Guide to the 2015 Rugby World Cup. 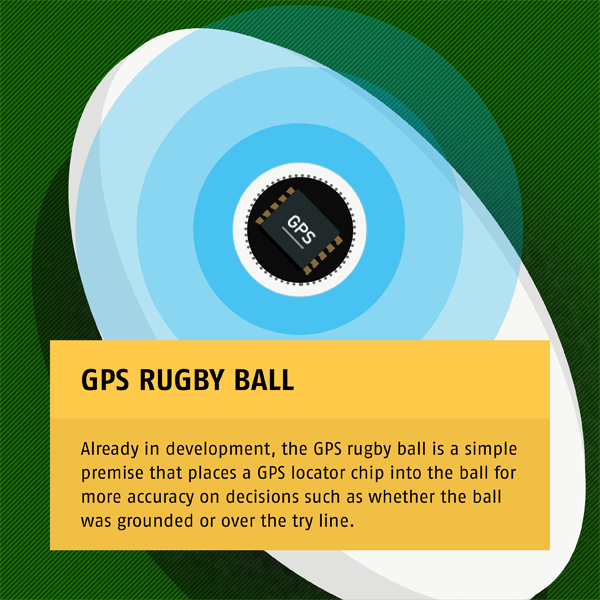 They came up with the following possible innovations that we may or may not see in Rugby World Cup competitions of the future. Some food for thought. I have just completed listing all of the rugby union national team names and was surprised to find out that Ireland and Scotland don’t really have one, and that England’s name of the Red and Whites is also not commonly used. Here in the southern hemisphere the terms Wallabies and All Blacks are practically the official names of the national teams of Australia and New Zealand. However, have you ever heard of these teams that are in the current Rugby World Cup: Bati (Fiji), The Brave Blossoms (Japan), Welwitschias (Namibia), and the Oaks (Romainia)? The beep fitness test should not be taken lightly. It is a maximal test, which means the participants are required to go as hard as they can for as long as they can (though they do not always do this). This was highlighted recently when 27 year old Welsh man Adam Rumming died while performing the bleep test as part of an army fitness test at the Sandhurst Academy where elite British Army officers are trained. He is believed to have had an undiagnosed heart problem, which is often the case for sudden death during exercise in seemingly healthy young people. If you are ever in charge of conducting fitness testing, particularly exhausting tests, you should exclude anyone with a fever or other risky medical condition, or even better get them to complete a PAR-Q (Physical Activity Readiness Questionnaire). It is interesting to compare the popularity of the different football codes between the Australian states – historically SA, VIC and WA are AFL states, NSW and QLD rugby states. AFL appears to be recently making headway into the northern states, and starting with the kids is the way to go. One thing I believe that makes Aussie Rules a popular sport with kids, and gives it an advantage, is the ability to have a social kick to kick. In comparison, throwing a rugby ball to each other does not have the same excitement. The highly physical nature of the rugby codes also does not lead themselves to school yard play. With the issues of liability and the concern about injuries, we may see a gradual change to AFL. Soccer may beat them all, but that is another story. Want to be a Wallaby? The Wallabies (Australian Rugby Union team) came to Melbourne last night, easily winning the game 43-18 and taking out the Cook Cup. There was a crowd of over 40,000 at the Telstra Dome, which is great for a non Rugby state, though it was probably mostly made up of interstate ex-pats and English tourists. Although I am not the greatest Rugby fan, I enjoy watching any Australian team and make an effort to understand the game. Out to dinner recently, I was reminded of the lack of understanding that many Victorians have of the game, when I had to explain the differences between Union and League. The final State of Origin Rugby League game is being played in Melbourne in a couple of weeks, and again I don’t think that many locals have an appreciation of the significance of this series decider, much to the frustration of many northerners who would lap up a chance to be here. I suppose I’ll just have to do my bit and educate the Mexicans about the differences between the rugby codes.